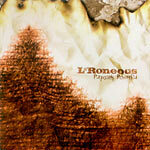 L*Roneous returns with his official followup to 'Imaginarium' with an album well worth the wait. Everything lyrically you'd expect and beats by new friends and old! Out of print for years, we're hoping for it to be re-issued on Solidarity Records soon!